The number of foreign fighters in Syria has gone up from 12,000 to at least 27,000 since June 2014, according to a new report by a security consultancy. The report from the Soufan Group says Arab countries supply the greatest number of recruits. Outside the region, recruitment has risen markedly in Western Europe and Russia and Central Asia, it says. The report says the average rate of returnees to Western countries is now at about 20-30%. This presents "a significant challenge to security and law enforcement agencies that must assess the threat they pose," it says. 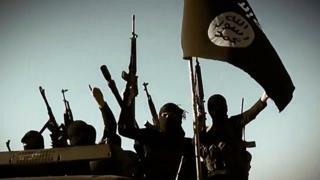 "In the countries with the largest flows, recruitment to the Islamic State has become more focused and localised, with fewer people just leaving on their own; family and friends are playing a greater role," the authors say. They claim that the recruits for the so-called Islamic State and "other violent extremist groups" come from at least 86 countries. They say that the largest single group of foreign fighters is Tunisians, numbering some 6,000. The second-largest is from Saudi Arabia, which the report puts at about 2,500, followed by Russia (2,400), Turkey (2,100) and Jordan (2,000). About 5,000 fighters come from EU countries, with some European countries contributing a "disproportionate percentage". The report cites official figures indicating that about 1,800 individuals had left France to join the fighting, with 760 each from the UK and Germany, and 470 from Belgium. Based on these estimates, more than 3,700 of the EU fighter contingent come from just four countries. However, the authors say recruitment from North America has remained largely flat and that "recruitment within the Americas has been mostly reliant on social media, particularly in the initial phases of the process". "We have to find better ways to address the Isis [Islamic State] appeal," Richard Barrett, a former head of global counter-terrorism at Britain's MI6 intelligence agency who contributed to the report, told Reuters. "The Leytonstone rebuke 'You ain't no Muslim, bruv' does far more to undermine Isis than dropping bombs on Raqqa," Mr Barrett added.